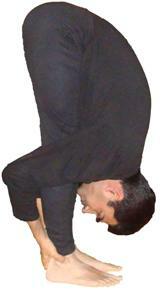 Hastpadasana is one of the twelve basic asanas. You must master this pose and its variations before trying the advanced Asanas. Stand erect and keep both the legs touching each other. Take a deep breath and keep both the hands up. Now go on exhaling. Bend in the front. Place both the hands on the ground on both the sides of the legs. Touch the head on the knees. Do not bend the knees. Hold the breath outside. Stand steadily in this bent position. Maintain position and suspension of breath 6 seconds. Inhale and then return to the starting position. Disorders of the belly and digestive system are corrected. The chest and hands become stronger and you become well balanced, beautiful and good looking. Diseases of the feet and fingers are also corrected. Not for the people who have spinal problems, vertigo, hernia, cardiac problem, hypertension, ulcers, myopia.